This time of year I have found myself reminiscing a lot about last summer before the summer holidays started. Because the boys were both being homeschooled at the time, it just gave us time to do so many fabulous things. Once of the best things was getting a few days away in Cornwall last July (yes - a whole year ago - last July - this post really is rather overdue!) We had the most glorious weather and just had an awesome time at Sands Resort and Spa in Cornwall. 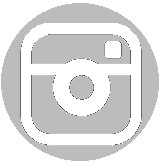 You can see a little video here that we put together of our holiday snaps. The weather was so great that we just spent the whole time either in the outdoor pool or at the beach. As Sands hire wetsuits for free, we took the opportunity of using them for our visit to the beach. After spending a good 45 minutes or so getting the kids kitted out in their wetsuits followed by lots of heaving and squeezing and shoving and pulling to get ourselves squished into our wetsuits, D looks at us up and down and simply states: "You look slim." Then silence. I'm still not quite sure what he meant by it as I certainly didn't feel or look slim having had to squeeze so tightly into the wetsuit - but I just sense it was his relief that we finally managed to get the wetsuits on. Linking up to Actually Mummy's Wot So Funee as it was Helen's post about their lovely time at Sands that reminded me to write this one up! Once again Miss T has been busy in the kitchen, helping both mum and dad with the cooking ready to link up with Kids in the Kitchen. In my usual haphazard way of cooking to use up ingedients that need using up, I had a pack of diced chicken and a pack of panko breadcrumbs I had bought out of curiousity so we put them together to make Panko Chicken Nuggets. After a quick reminder to make sure Miss T remembered not to eat the raw chicken and not to put her hands near her mouth whilst handling raw chicken (after the sausagemeat incident a few weeks ago!) we were ready to start. So not really a proper recipe today as it is just a case of taking the chicken pieces, dipping in plain flour, then into a beaten egg (mix in a little milk to make the egg stretch further) and then toss into the panko breadcrumbs to coat. They were then fried in rapeseed oil to start the cooking process, then finished off in the oven at 180C for 15-20 minutes until thoroughly cooked through. Panko breadcrumbs are a japanese style breadcrumb that is lighter and fluffier so can end up tasting crispier. They turned out really well and are a much healthier option than processed chicken nuggets. With the rest of the chicken, she helped daddy make a chicken and bacon pasta bake. This little girl just can't get enough of cooking! I've always loved felafels. Mum had some Lebanese friends when we were growing up and they made some awesome ones. But I'd never made them before. I decided to have a go at making my own on the basis that I had some fresh parsley and lemons that needed using up and I had some tinned chickpeas and cannellini beans sitting in the cupboard. So as seems to have become my customary way of trying new recipes I just tried to put together things I had at home and see how it turned out. Around half a teaspoon of each of the following: ground coriander,ground ginger, black pepper, ground cinnamon, ground cumin, garlic granules. 1. Drain the chickpeas and cannellini beans and rinse in fresh water, then drain. 2. Blitz together the chickpeas and beans in a food processor (I used the chopper attachment of my hand blender and made sure I didn't in small batches so that it didn't overload it). Transfer to a large bowl. 3. Chop the parsley, first removing any large stalks. Again I used the chopper to do this but you could cut with a knife or scissors. Add to the chickpeas and cannellini beans. Finely chop the garlic and add this in too. 4. Squeeze in the lemon juice, then add the spices and seasoning. 5. Mix well. Then chill the mixture for 30 minutes. 6. Shape into small balls or patties and fry in rapeseed oil, turning over until golden brown on both sides. Serve with a side salad and flatbreads. My felafels turned out a bit soggy. I'm wondering whether there was too much lemon juice perhaps? Or maybe it was because I didn't chill the mixture like I was supposed to. I still liked the taste though. I just had to handle them carefully so that they didn't fall apart. Other than the oil for frying them, I reckon they're pretty healthy too. Sorry the photos don't make them look too appetizing - but they work well with a colourful salad or wrapped in baby gem lettuce leaves for a healthy lunch. Inspired by seeing Raisie Bay's naan bread featured in kids in the kitchen a few weeks ago, I decided that it would be great to try to make our own naan bread. By coincidence, I had come across another naan bread recipe in the May issue of delicious magazine at around the same time, so I'd left the mag open on that page since then as a reminder to myself. Well we decided that today was the day. I'd mentioned it to Miss T earlier in the day so when she said 'make bread', I knew it was time to get started. Because Naan bread is relatively flat, I had no idea that we'd need to allow 'rising' time, so Miss T helped at the start but then it was her nap time so I did the rest after that. The full recipe from delicious mag can be found online here and Raisie Bay's recipe for naan can be found here. We largely stuck to the delicious mag recipe because I had a paper copy so it was easier to follow than leaving the iPad on whilst cooking. I didn't have any white stoneground flour, so I used 400g of strong white flour and topped it up with 100g of stoneground whole meal flour. I also didn't bother to brush the naans with butter once cooked, nor scattered with any salt or seeds. Miss T helped to measure and mix together the 100g full fat live yoghurt, 160ml milk, the half teaspoon each of salt and sugar and half a teaspoon of yeast dissolved in 75 ml tepid water. The milk and yogurt should ideally be at room temperature. We also measured the flour together and she helped make a well in the flour to add 2 tablespoons of rapeseed oil. Then she poured in the yogurt/milk/yeast/water mixture into the flour and did her favourite job - 'mix'. The dough needs a minute of kneading, then to be covered and left for 10 minutes before kneading again for a minute or so. 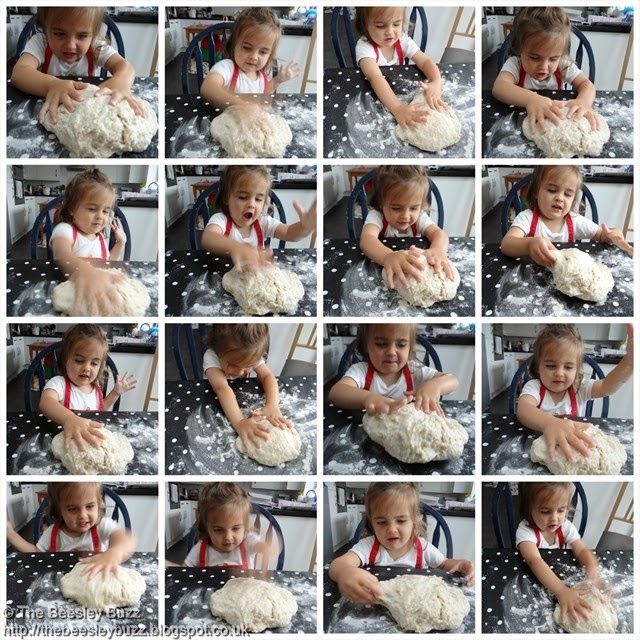 Miss T loved the kneading stage and really got into pushing, poking and whacking the dough. It gets covered again and put in a warm place, this time for 1-2 hours. The recipe then suggests diving the dough into 4-6 balls. We managed to get 12 out of the dough as I made each smaller so it would roll thinner and cook more quickly as I didn't have a lidded frying pan that the recipe requires. Rather than use just fingers I used a rolling pin to get the dough quite thin. Then using fingertips added rapeseed oil to both sides of each naan. Each one cooks in a matter of minutes in a dry pan on the hob. Turn over when one side is cooked to cook the other side. This part is really similar to the flatbreads that we like to make. If you ever need a speedier alternative to naans, the flatbreads are mega simple and quick to make but just like warm naans are extremely morish and will be eaten in one go! I loved the softness of the naans and the elasticity of the dough. And yes they did all get eaten by the whole family in one sitting! It's so hard to explain to our little ones just how much we love them, but 'Guess How Much I Love You' begins to give an idea with its endearing story of Big Nutbrown Hare and Little Nutbrown Hare trying to out do each other by telling the other just how much they love they have for them. We have our own Little Nutbrown Hare here in the form of Miss T along with Daddy who has taken on the role of Big Nutbrown Hare. And we were pleasantly surprised to find that Heinz Alphabetti contains 1 of your 5 a day with 'a whole tomato squeezed into every portion'. So you can have lots of fun making names, words and quotes with the yummy alphabetti pasta as well as it being another way of showing your little ones just how much you love them by getting 1 of their 5 a day into their meals! “This blog post is an entry into the Tots100/Heinz competition to support Children’s Book Week”. You can find more details here. Last week was a little stressful. J had a few wobbly days. Having had 7 perfect months at his new school (7 months!!! where did that time go!) he had a couple of wobbly days at school too. Nothing major, just struggling to focus on one occassion and struggling to listen well on another occasion. So pretty minor given all his previous difficulties when he was younger at school. But still a wobble. Friday evening stress levels grew higher still. 'I don't want to go'. 'I'm not going'. 'I'm staying home'. He was worried about Saturday. There was a taster day at one of the secondary schools that we had been considering for him. Saturday morning was much the same. Even though I had phoned them and talked him step by step through what was going to happen and what the timetable was. He still didn't want to go. Daddy agreed that if necessary he would stay on site and be with J to support him as much as he needed it. Then after a short while Daddy came home after dropping J off. Much to my amazement he stayed. We kept our telephones close at hand waiting for the phonecall to come. It never did. 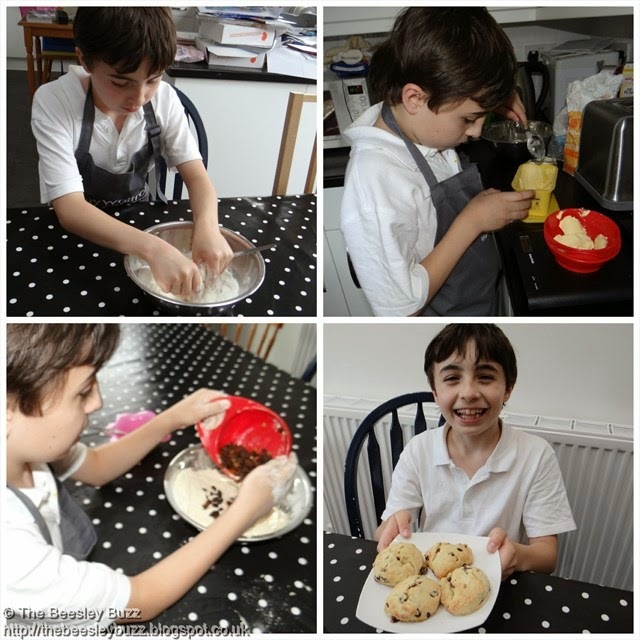 At pick up time, J emerged with a bagful of scones he had made and a big smile on his face. He had really enjoyed the day. They sent home a copy of the recipe so he made another batch at home soon after. Here's the recipe (slightly amended as we used more dried fruit and a little more milk). I love the fact it is a real Step-by-step method so that J could work pretty independently in the kitchen. 1. Pre-heat the oven to 220C and grease a baking tray (we used fry light spray). 2. Measure out your ingredients. 3. Sieve flour into a large mixing bowl and add the sugar. 4. Rub the butter into the flour mixture until the mixture resembles breadcrumbs. 5. Add the dried fruit. 6. Crack an egg into a glass and check for any shell. Beat the egg with a fork and stir in the milk. 7. Gradually add the egg and milk mixture into the flour. Keep a little of the milk and egg mixture to one side. Mix slowly to form a dough. 8. Turn the dough into a lightly floured surface and knead very gently to bring it together into a ball of dough. 9. Roll the dough no thinner than 2cm thickness using a rolling pin. 10. Cut out circles (or other shapes - J made a dinosaur one using a dinosaur cutter) and place onto the baking tray. 11. Glaze the scones with leftover egg and milk. 12. Cook for 8-10 minutes until golden brown. 13. Allow to cool on a cooling rack. Linking up with Small Steps Amazing Acheivements which is being hosted over at Autism Mumma this week whilst Ethan's mum takes a rest in preparation for the new baby! 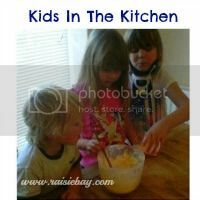 Also linking up with Raisie Bay's Kids in the Kitchen of course - Which I think everyone on the planet should link up with because it is great for reminding us to let the kids get involved in the kitchen and it has really inspired us so much with our cooking. 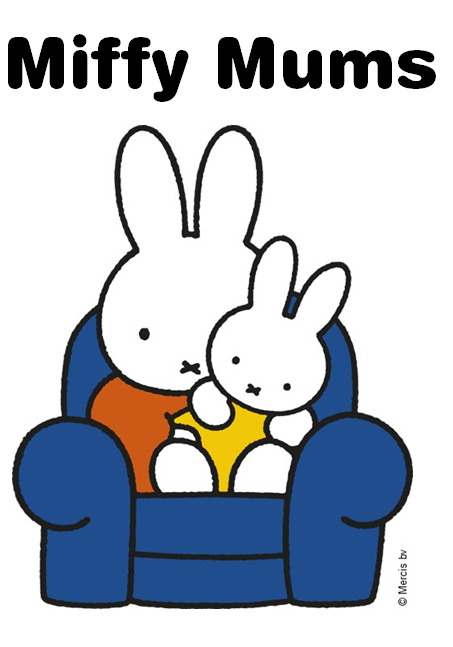 Here we are for this month's Draw with Me linky which can be found over at This mummy loves. The theme is another fabulous one - Space! Miss T got busy drawing this picture and I've labelled some of the planets on there for her. She only used colouring pencils and so the picture has come out quite faintly so not too clear to see on here - apologies. I've also had a big 'mummy fail' moment because I was going to scan in her original picture so it would show more clearly but I have managed to lose it! Although I'm feeling relieved that I took this photo of her with her drawing so we at least have something to show you. The boys have both been exhausted and although they are still loving being back at school, they are finding this last stretch of term tiring. D has been moaning that the school day is too long - Which I have to say I agree with! I have gone for an outfit that would be perfect for a family adventure day out. J and D both love adventures - out and about, in the woods, running across fields. Anything outdoors and using lots of energy. And Miss T is starting to enjoy the same - whether it is running around the garden with her brothers or walking in the countryside carrying Hoppy and Patch and holding my hand. These sturdy Salomons boots from Blacks are perfect for hiking outdoors, but lightweight enough to be worn all day whilst adventuring with the kids. The boys will tell you that my current pair of boots are starting to fall about from being worn so often, so having a decent pair that lasts is a must! These fantastic Levi's chinos from John Lewis are ideal. Lightweight and strong, they look just the part. And, being cotton, they will clean easily from any incriminating dirt from the adventure! These Ralph Lauren sunglasses look great and have the added advantage of being foldable across the middle. So they look fantastic when the suns out, and can be safely tucked away if we suffer from a typical British summer! I'd love to have a decent watch again like this Fossil from The Watch Hut. As well as looking great and keeping time, it has a tachymeter and chronograph function to help time and keep track of the kids as they dash about. Waterproof, too, in case the adventures get a bit wild. 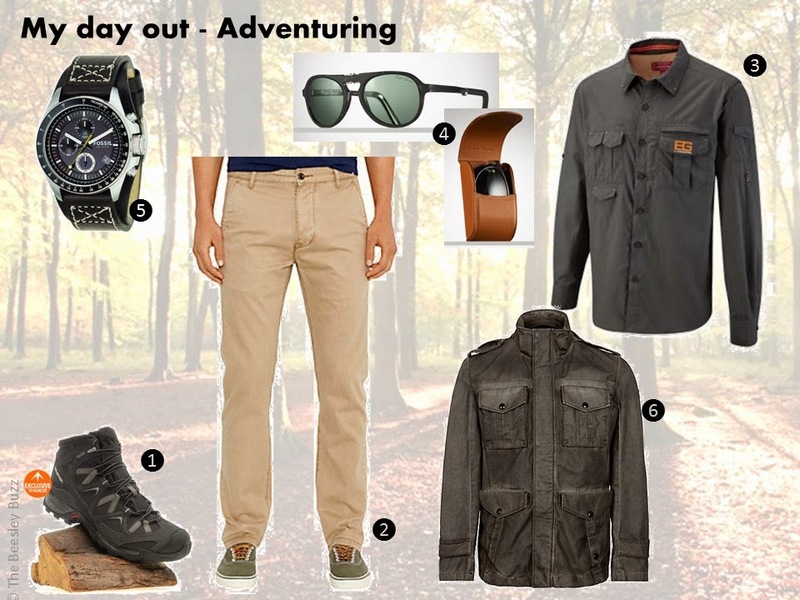 Just in case the summer weather does take a turn for the worst, this Boss jacket from John Lewis not only looks amazing, but will keep me adventuring whatever the weather. This is my entry for the Outfit of the Day competition run by The Watch Hut hosted over at The MAD Blog Awards.